Suspicious Heuristics: How Many Students CAN Actually Work Through School? How Many Students CAN Actually Work Through School? A decent article in The Atlantic by Jordan Weissmann today. He looks at employment levels of college students over the last 40 years, and argues that economic conditions have made it harder for undergrads to find employment and pay their way through school. Source: Jordan Weissman, The Atlantic. ...here's my take: There are a limited number of jobs that are open to students (a college town can only have so many barristas, after all), and more students than ever to compete for them. Meanwhile, it's hard time for anyone to get work, especially those who don't have a degree. Perhaps we shouldn't expect it to be any easier for young people still looking to earn theirs. This is all perfectly reasonable, as far as it goes. But I'd like to propose another causal story, which is perhaps a richer account of the available data. One weakness in the graph above is that it only shows a percentage, not the raw number of students in school or employed. 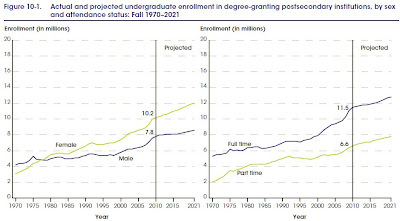 Looking at the same data source as used by Weissmann, a report by the U.S. Department of Education, I found the following graph which displays the number of male/female, and full/part-time students from 1970 to the present. USDE, Condition of Education 2012, p. 35. Click image to see full-size version. 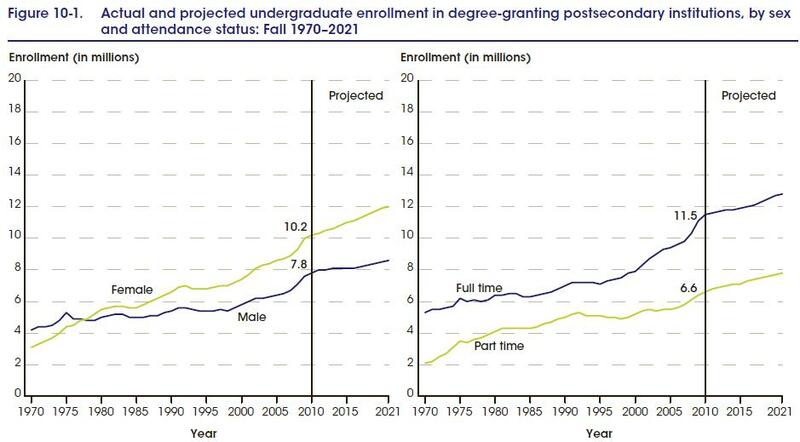 Number of men enrolled has doubled since 1970, and the number of women enrolled has tripled. Meanwhile, the overall U.S. population has risen from 203 million in 1970 to 311 million, and increase of just 50%. Clearly, college attendance is being driven by more than just population growth: people who, in a previous decade, would not have chosen to attend college are now doing so. Higher average college attendance tells something about the type of people now attending American colleges. If (suppose) only the top 20% of students in 1970 went to college, and now the top 40% of students go to college, the median percentile of "student quality" (whatever that means) has dropped from about 10%, to about 20%. In other words, the average student in 1970 was probably more determined, intelligent, and motivated than the average student in 2010, simply because it was more extraordinary to go to college in 1970. Hence my slight twist, and more literal interpretation of Weissmann's article title. Determining whether a student can work during college depends on more than just number of students and number of jobs, it also depends on quality of students. Can you hold down a 40 hour a week job and also be a full-time student? Some certainly can, but not everyone. Of course, as Weissmann emphasizes, there are only so many college-friendly jobs available, and we can't all work as barristas. However, this also speaks to the types of majors that modern college students are choosing. An English or philosophy student has few marketable skills before getting a degree, but a second- or third-year engineering or computer science student might already be able to do useful work in the field. Meanwhile, the number of students in STEM disciplines has remained stable since 1970 while the number of overall students in college has skyrocketed, leaving a smaller proportion students with marketable skills. Economic conditions certainly play a role in the number of college students able to get work during school, especially as they compete with out-of-work professionals who already have job experience. However, the other side of the story is that the characteristics of college students have also been changing over time based on choices and aptitude of the students.